Hello, friends! I hope you all had a great weekend! I’m recovering a bit from a crappy cold, but I’m excited to share Meg’s third organizational post today! In case you missed them, check out Day 1 and Day 2! Hi again! 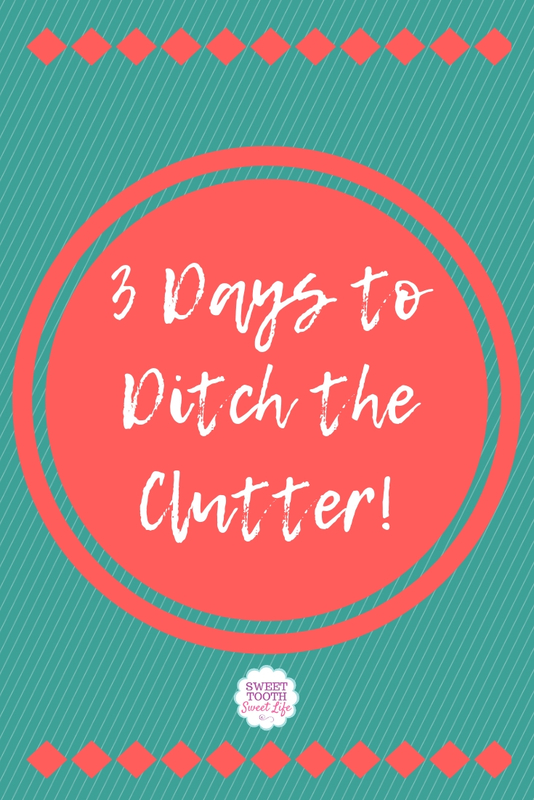 Just me, still talking about decluttering and getting your house and life set up for the year ahead. Annnyyyyway. We left off on tackling part of our bedroom and closets. We’ll pick up right up in the bathroom. Let’s start with something really quick and simple. Unless you specifically remember doing this recently, go around and replace all the toothbrushes in your house. New year, new toothbrush. 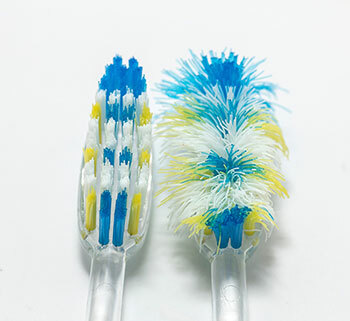 According to the American Dental Association (ADA), you should replace your toothbrush approximately every three to four months, or sooner, if the bristles are frayed. Grab whatever calendar you use most, and jot down that you’re due for new toothbrushes again in mid-April. I went online to try to find an inspirational picture to put along here. This is what I found. What in the world!? How hard a brusher are you to get a toothbrush “frayed” like that?! 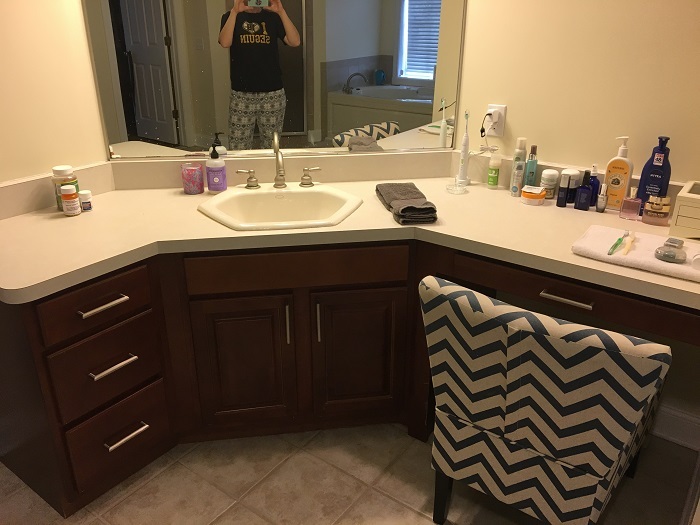 Today I am wiping down and assessing all the beauty products that are on my counter — face moisturizers, hair spray, lotion etc. Do you use it all? Are any of the bottles almost empty? Any items that are low, add it to you ‘To Buy When on Sale’ list. 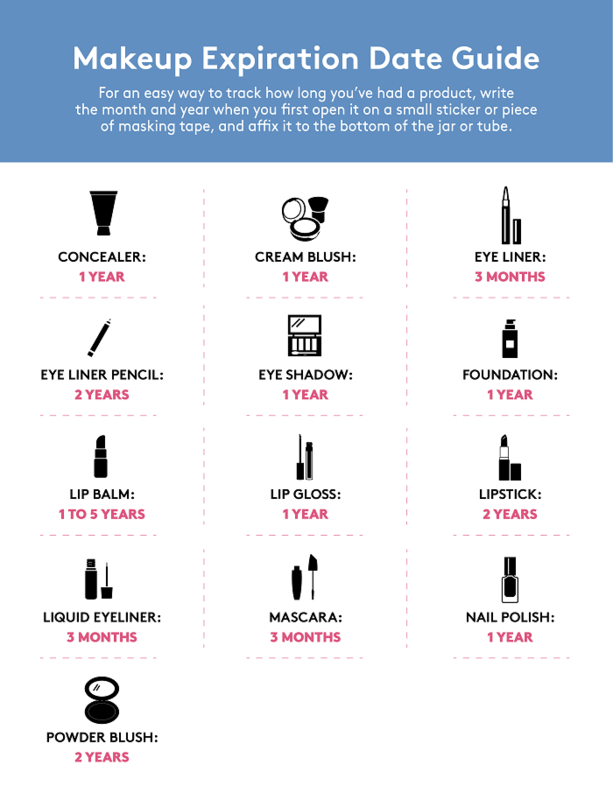 In the makeup area, be sure to think about when you bought the item or check for expiration dates. Again with the expiration dates! 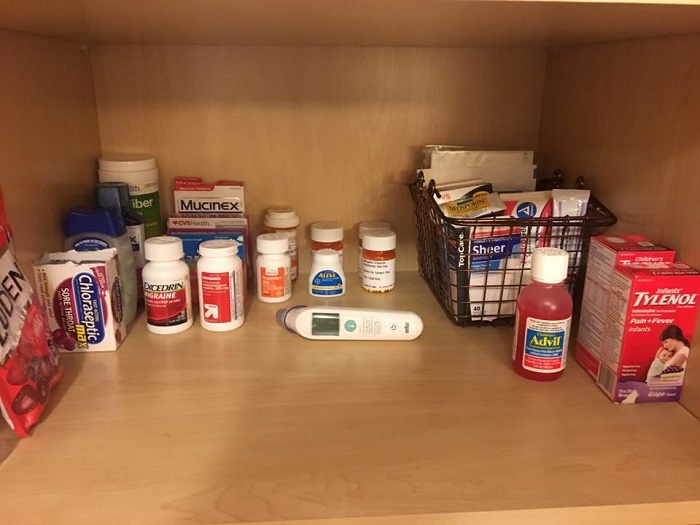 The real focus as we venture into our medicine cabinets is to check inventory and expiration dates. I am going to make a list of the items that we need – Neosporin and small bandaids, for example — and I will be on the look out for one of those $5 off when you spend $20 deals at Target, or when the items are on a good sale. No need to rush out and buy the items at full price. Worth noting…I double checked with my go-to doctor friend, and he said there is little to no reason why you should buy a brand name of an OTC over a generic. The ingredients are almost always the same, only difference in price. Obviously, do your research here, but I know I will be buying the Target brand of acetaminophen instead of Tylenol. What should we be doing with old medicines – over the counter and prescription – that we’re not going to use?! I will admit, I’m guilty of dumping stuff down the toilet. I thought I was doing the safest thing. As I researched this question, I keep reading that is frowned upon in most situations. Noted, FDA! 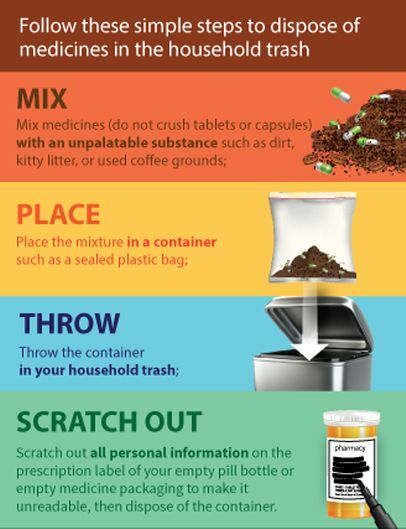 The safest, best route to go is to find a nearby “Safe Drop Location” where you can bring your old meds. CVS will help you locate one: Click Here. Most hospitals accept them as well. For example, where I am living, there is a drop off spot located right in the entrance way of the hospital ER department. Nice! Day 9: Clothes. Oh Good Lord, the clothes. Give Back Box, where are you!? Make sure you have a box or bag ready for everything you are going to donate, sell or give away to a friend. In case you haven’t heard, the KonMarie method suggests taking out EVERY. SINGLE. PIECE. OF. 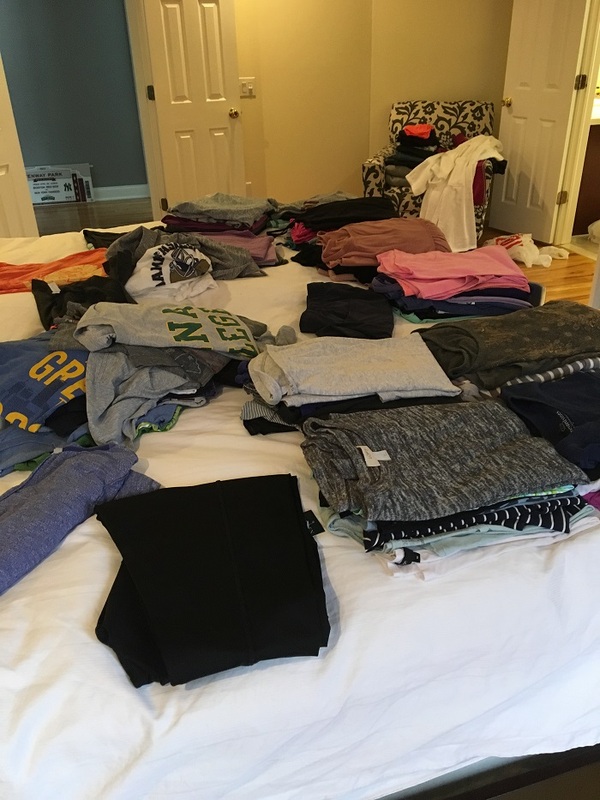 CLOTHING you own and form a literal mountain of clothes and sort through piece of piece. There’s a lot to like about this. I like that this forces you to see and touch everything, but at the same time, this is an extremely daunting task is you do it all at once. If you are up for the challenge of taking EVERYTHING out at once, that is very admirable. Go get ‘em!! For me, I am going to group my clothes together. All the shirts will come out, Ill get them organized, and then put them away before I move onto pants, socks, dresses, etc. This feels much more manageable and allows me to split up the clothing task into more than one day. –Marie Kondo’s theory of “Does it Spark Joy” is clever. How do you feel when you look at the clothing? Do you just feel guilty because it was expensive so you feel you MUST keep it? Donate it. Do you feel like it will be great when you lose (or gain!?) weight? Pass it along to someone else. Do you look at it and love it? Back on the hanger it goes! –Be careful attaching feelings to clothes. I’ll use my prom dress as an example. I will never wear that again, and yet it sat in my childhood closet until a few months ago when my mom was finally like “Do SOMETHING with it, Meg.” So now, it’s sitting in our hallway closet next to my kids winter coats. It’s going to be donated this week. –When it comes to clothes, keep only what is VERY important to you. That way you will be wearing your favorite things, and you’ll only own things that you love! The rest…live and learn. And for heavens sake, be really careful about buying anything new…regardless of how great the sale is, or how cute Erin from Living in Yellow looks in it! As you can see, I don’t follow the KonMarie folding techniques. 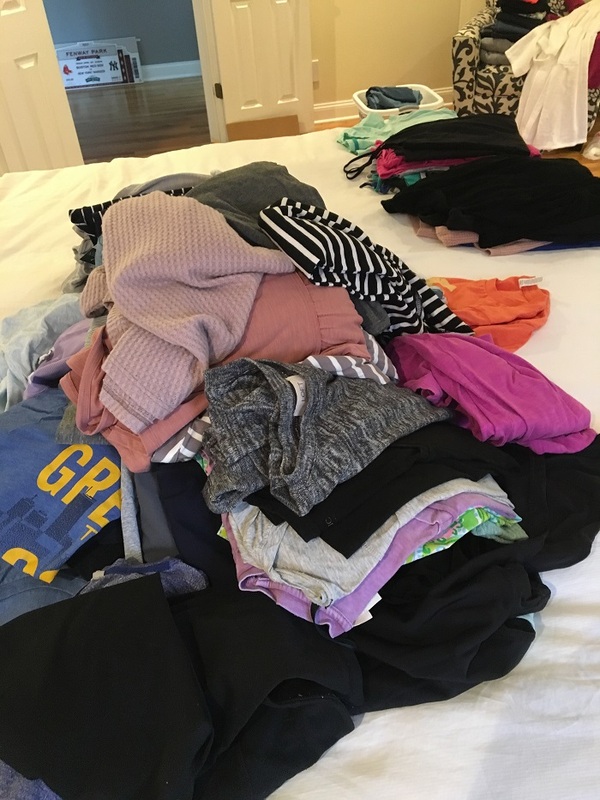 They are wonderful and beautiful and practical which I LOVE, but I found it to be too time consuming… If you would like info on how to fold like Marie, click here for her Youtube channel. **Take a minute and create two lists some point this week. I keep mine in my phone because its easily accessible. Perhaps you have a Very Important Information Notebook. Wherever it goes, just make sure you remember where you put it. On this list, keep any important information for the car you drive. License plate numbers, VIN numbers, when the next inspection and registration is due, when the last tune up was, any major repairs, etc. I also keep the road side assistance phone number in this list. Here, keep a list of everything you have an automatic payment plan set up for. Anything that is charged automatically to our credit card or bank account — Netflix, the gym membership, Verizon cell phone bill, etc. — will be here. If, heaven forbid, you get that awful message that your credit card has been “compromised” it’s not going to be AS bad knowing that you don’t have to try and remember all the companies you need to call and updated credit card information for. **Flip over all the items in your house that could potentially scratch your floors. Make sure all the chair legs, table legs, etc. have a little felt pad stuck to them. Even those chairs and table legs that you know you put them on in the past – I found that many of mine fell over over time. **Check all the light bulbs in your house. Do any need replacing? Do it all in one swoop. Running low on replacement bulbs? Keep an eye out for a great deal on light bulbs and stock up! I have found light bulbs for great prices at Target when they have 25% off all light bulbs on Cartwheel. **Check your battery supply. AA, AAA, C, D, etc. Are you low? Keep an eye out for a good time to stock up during a great sale. Here in Canada you can return all unused and expired medications to any pharmacy. I just take them out of the packaging and dump them into a bag and drop them off - it's super easy. 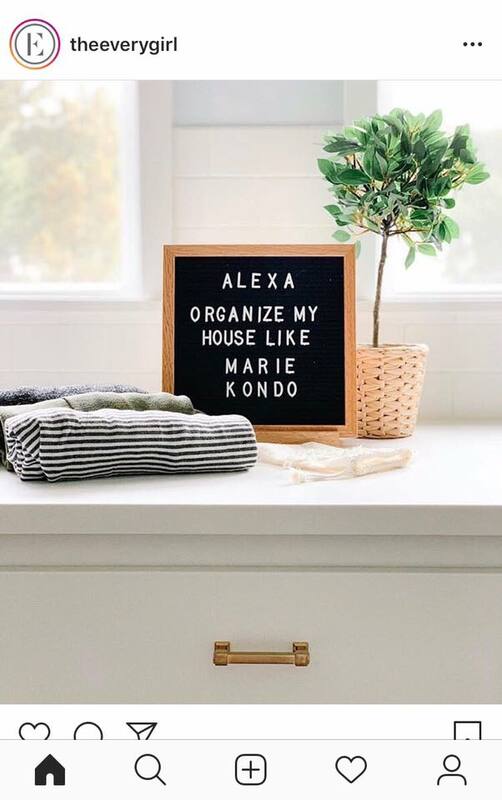 Ha, I finally started watching the Marie Kondo show last week because I've heard soooo much about it. I do like the tips! Especially in regards to clothes, but now you motivated me to try and tackle my medicine cabinet! Oh boy, haha! 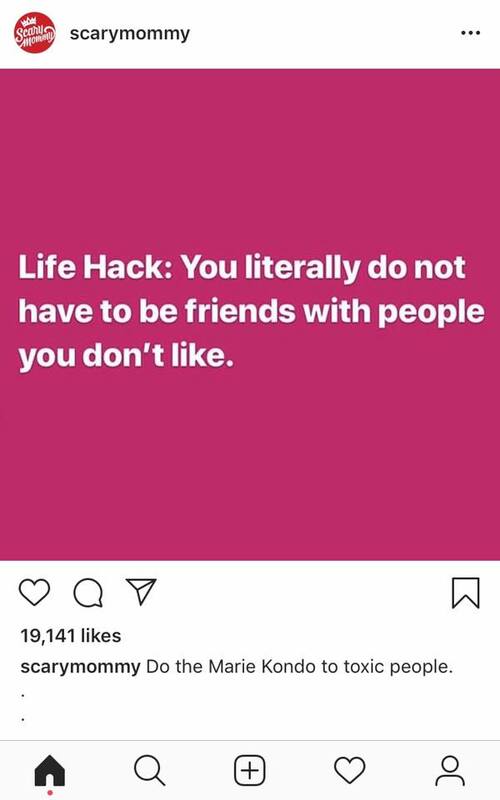 I haven't read her book or watched Marie Kondo but have heard/read enough about her online to see what some of her tips are. As I was organizing my kid's drawers I went through and rolled everything and it did look very nice and tidy and I liked that I could see everything - but then when I did laundry and was folding clothes to put away it felt like extra work to roll them (in the laundry room) and get them to their rooms to be put away while staying rolled so I went back to folding them the usual way. I'm not very good at updating my makeup and wear a lot of it past it's 'expiration' date but it's a good reminder to replace things.